In this activity you specify for each variant which posting periods are open for posting. Two intervals are available for doing this (period 1 and period 2). For every interval, enter a lower period limit, an upper period limit and the fiscal year. 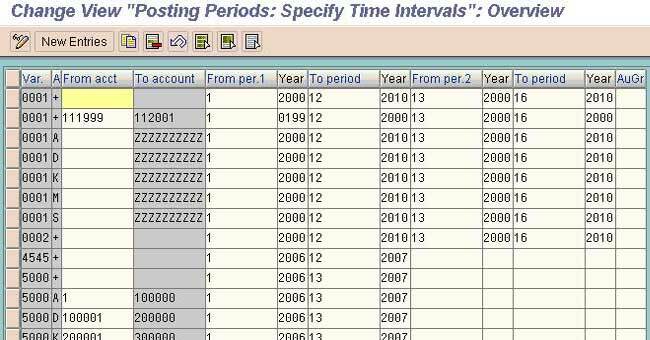 You close periods by selecting the period specifications so that the periods to be closed are no longer contained. Maintain the open and close posting period with OB52. 3. Company code and G/L range. How From period to period is chosen and From year to year is chosen, is it we can update fiscal year in all fields of ( From year -to year). Could you please explain it of how periods can be kept open and closed, and How the year should be chosen.